A diamond is all about light, how much is taken in, how it is refracted around on the inside and how much is reflected back towards the eye. The more light there is, the more the diamond will create sparkle, fire, and brilliance. Most people are familiar with the four C’s, carat, color, clarity, and cut. Cut is the most important in terms of beauty for a diamond. More than anything else, cut determines the sparkle and shine that a diamond will possess. My last post dealt with the displeasing face- up patterns that are seen in a diamond when the symmetry and portions are off. I wanted to follow up with a post on Heart and Arrows, which can be seen in diamonds of Very Good to Excellent cut grades. When a diamond’s facets are perfectly pointed and the top and bottom facets are ideally aligned, a diamond is able to optimize the dance of light seen within. You may be familiar with a branded diamond on the market called Hearts on Fire. 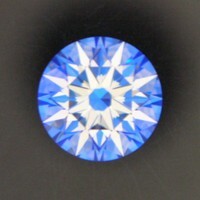 Hearts on Fire are advertised as a diamond whose symmetry are cut to precise angles and portions, giving it the ability to maximize the light play. An arrows pattern is seen from the face-up view, and a hearts patterns is seen from the bottom when viewed through a Portion Scope. After grading hundreds of diamond’s, I have found that really well cut diamonds given the grade of very good to excellent on symmetry may show a hearts and arrows pattern as good as those seen in the branded Hearts on Fire cut. Pictures taken at our office. When diamond shopping, it is important to weed out the garbage. The beauty of a diamond depends almost entirely on the cut. The face up patterns seen inside the diamond are important indicators to the diamonds proportions and symmetry. In the right hands, rough crystals are transformed into finished diamonds with spectacular brilliance, fire, and scintillation. A well cut diamond has a pleasing display of bright and dark reflections in its face up appearance, that are balanced in size, composition, and contrast. Diamonds that have lower symmetry grades (Fair and Poor) will tend to have distinct dark areas that detract from their face up appearance. The patterns seen in the face up appearance of a diamond reveal the choices the cutter made during the fashioning of the gem. In round brilliant diamonds the table and crown (top portion), affect how light will enter and exit the stone. The pavilion (lower half), governs the path the light will take once it is inside the stone. A diamonds pavilion facets take the entering light from above and reflect it back toward the crown, which gives a diamond its dazzling display of brilliance. Diamond cutters will sometimes try to retain weight from the rough, by deepening the diamonds pavilion, causing the diamonds pattern or face up appearance to be excessively dark. Increasing the pavilion angle leads to light leakage, this ultimately diminishes the diamond optical light performance. When cutters try to maximize the yield produced form the rough crystal, by giving the diamond a shallower crown and pavilion angles, thus giving the diamond a visually larger appearance, can cause the diamond to appear dull. Dark Upper Girdle: Upper girdle facets or portions of them, display a dark or black appearance. This pattern tends to make the diamond visually look smaller, and as if the girdle were chipped. 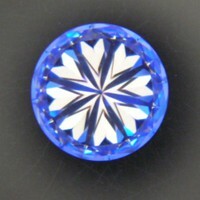 Culet-in-Bezel Facet: Reflection of culet creates a busy and confusing pattern.